Yuri Vella is certainly the most famous of the Forest Nenets. He was born in 1948 in the village of Varyogan, in Western Siberia, and his life has quite different from the one of other Siberian indigenous intellectuals: he has never spent long times away from his village and his region and he has never lost contact with the Khanty and the Forest Nenets that live there. 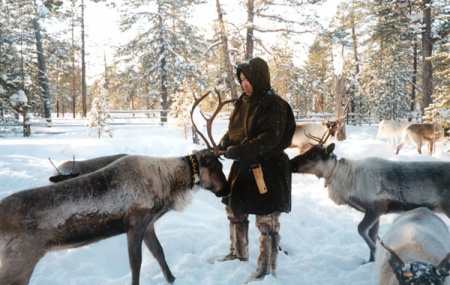 Since the beginning of the 1990-ies, he lives in the forest with his family and his reindeer herd. He is well known for different activities: first of all as an intellectual and a writer, but also as the leader of the Forest Nenets and a fighter for his culture. He has contact all over the world, among others with the Universities of Berlin, Tartu and Helsinki, as well as with the Native Americans’ organisations. ?uch has been written about him, several documentaries have been shot. The aim of this homepage is to gather his own literary texts and what has been written about him.